Completed your B Pharma course and searching to get a pharmacy govt job? Many aspiring Candidates are looking for the Latest Pharmacist Vacancy in various Posts of Pharmacist Vacancy such as Pharmacist Technician, Pharmacist Assistant, Pharmacy Clerk, Pharmacy Dispenser, Pharmacy Supervisor Jobs, Pharmacy Intern, Pharmacy Technician Trainee Jobs, Pharmacy Manager, mail order Pharmacy, Registered Pharmacy, Clinical Pharmacy Govt Jobs, Pharmacy IT Jobs, in Nursing Home Pharmacy Jobs, Pharmacy Administration Jobs, Locum Jobs, Oncology Pharmacists Jobs, Executive Posts, Psychiatric Pharmacist Vacancy govt Jobs, Virtual Pharmacy Jobs, and various other Pharmacy related Jobs. The Education in the area of Pharmacy has been increasing over the Years. Pharmacists are educated in pharmacology, pharmacognosy, chemistry, organic chemistry, biochemistry, pharmaceutical chemistry, microbiology, pharmacy practice (including drug interactions, medicine monitoring, medication management), pharmaceutics, pharmacy law, physiology, anatomy, pharmacokinetics, pharmacodynamics, drug delivery, pharmaceutical care, nephrology, hepatology, and compounding of medications. We have given a table where you can click on the desired link to check out about any vacancy that fits you. Check MBBS Job Here. What are the best government jobs available for the B. Pharm graduate students? The youth of today want to work for the government sector. The recent shift in the job preference of the job seekers is mainly due to the various benefits offered by the government sector. The government job provides more work-life balance, have a significant pay scale with medical benefits. As well as, the government jobs are secure. In addition to it, working under a government job gives the employees the satisfaction of serving the nation. The government is also desperate to tap into the vast pool of the educated minds in the country. They are opening up significant roles for the graduates in the prestigious departments of the Indian government. In the recent Budget, the finance minister has announced that a significant chunk of the national resources has been set assigned to create jobs for the youth of the nation. In another announcement, the finance minister confirmed that the government is set to generate more than one lakh jobs in the healthcare sector, particularly for the female graduates. 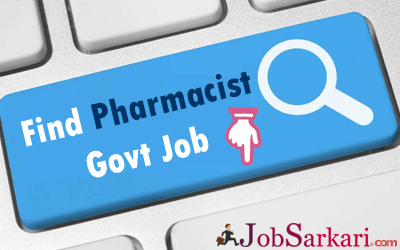 Each year the government of India recruits several candidates for the post of pharmacist. The recruitment is held through the process of national level examination. Besides this, each state conducts its own set of tests for recruiting the candidates for the post of a pharmacist at a government hospital. The employees can earn up to thirty-five thousand rupees with extra benefits like grade pay of around five thousand rupees, medical allowances, Dearness Allowances or DA, and so on. The students after completing their bachelor’s degree can enroll into the position of drug inspector under the department of drug control. The post is not only prestigious one but also a high paying job. The initial pay of the inspector would start approximately from around nine thousand and would rise to more than thirty thousand. In this job, the candidate has to evaluate the safety and the quality of the drug. Also, when required, the inspector has to carry out raids and prosecuting the guilty.